Inspired by a fellow traveler’s photo, I insisted WeighMyRack should make a stop at White Sands National Monument on the way to our next climbing destination in Hueco Tanks, Texas. As we had only planned to explore the park for a day but wanted to maximize our visit, we chose the most “strenuous” hike listed, the Alkali Flat Trail. This remote hike would also ensure our goal of getting away from the crowds of schoolchildren amassed at the picnic area who were gleefully shrieking and sledding down the dunes. We arrived at the trailhead, donned copious amounts of sunscreen and stuffed our pack with water. A debate ensued concerning appropriate footwear. Andreas chose to walk in his shoes while I primarily went barefoot. Gypsum sand is usually so soft that it feels like talcum powder. It is the nicest sand bare feet can touch! Occasionally it was worth slipping shoes on at the bottom of a dune, where you could still find hardened Gypsum. Historically (in Geologic terms), our trail would have passed through Lake Otero, a 1,600 square mile body of water. Instead, we found ourselves in the heart of the dunes with no water in sight. The dunes are here thanks to the nearby mountains and heavy rains; Gypsum in the mountains dissolves with the rain water and flows into the White Sands basin, where it gets trapped. 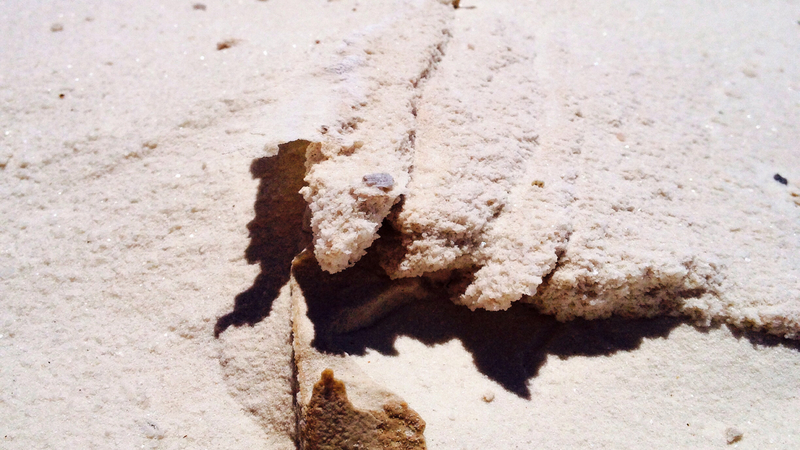 As the water evaporates in the desert climate the Gypsum hardens. Frequent strong winds blow apart the hardened gypsum and the crystals become smaller and smaller (and whiter) until they are incredibly smooth and fine. Nobody knows why the dunes stay in this basin and don’t get blown away completely–though they have tracked the sand as far as Oklahoma. If you look close in the picture above you can see the footprints of the Bleached Earless lizard. When these lizards exists outside of the park as the Earless lizard they are gray and brown. The White Sands lizards have adapted and evolved to blend in with their surroundings by becoming white (they’re not chameleon and cannot change color at will). There is a surprising amount of plant life in the dunes, particularly at the eastern end. The flora and fauna is due to the fact that, on the eastern side, water can be found only a foot below the surface of the sand. Less plantlife is found on the western side where the water is between 2-5 feet down and the winds are significantly stronger. Note: Although this water is close to the surface, it is non-drinkable due to it’s salty nature. Sand Verbena, it has a fragrant lilac-like smell. The dunes move an astounding distance each year. The western dunes easily advance over 25 feet, while the older eastern dunes still go about 8 feet a year. Plants have learned various ways to adapt to the migrant dunes: There are a few shrubs that make a hardened base out of the gypsum so they can get above the dune and when the dune leaves it stays tall on it’s perch (see picture below). The Skunkbush Sumac or Hoary Rosemarymint shrub sitting on their Gypsum platform. The Soaptree Yucca’s haven’t advanced as well evolutionarily. As the dune moves over the Yucca, their stalk grows tall enough (as high as 35 feet) to stay above the dune, but this just delays the inevitable: when the dune moves beyond the Yucca, the now incredibly large stalk can’t support itself and it falls over. Other plants can tell the dune is taking them over and they will drop all of their seeds. It’s strange to walk to the end of the dunes as they just stop instantly, instead of petering out. Nobody knows why or how this occurs. There are still so many fascinating mysteries in nature; we gained more questions than answers, excited at how many surprises there are left to witness in our environment. As we walked, ran, and danced up and down the dunes, some up to 50 feet tall, we would marvel at our surroundings. Although the desert is seemingly barren, once you start looking carefully you’ll notice lots of footprints and other signs of life. Suddenly, even finding an ant is worthy of exclamation. The trip was a great reminder to slow down and truly appreciate the smallest details of life, even if your shoes are filled with sand. Let us know if there’s any other details you’d like us to include on these posts via the comments!